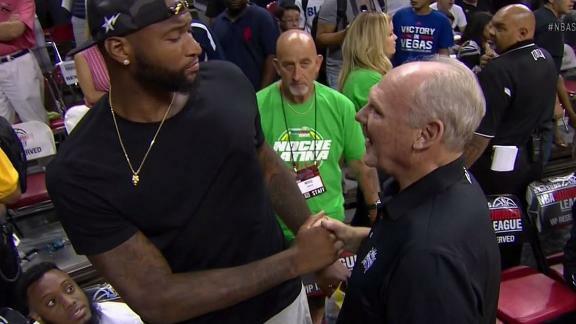 LAS VEGAS -- While it wasn't exactly a warm greeting, Sacramento Kings coach George Karl and center DeMarcus Cousins shared a handshake Monday at the NBA summer league. As Karl approached Cousins at the summer league, Cousins shook the coach's hand, put his head down, and then got up from his chair and started looking away. It's no secret that the relationship between the two is strained, as it was widely reported that Karl wanted to trade Cousins but neither Kings owner Vivek Ranadive nor VP of basketball operations Vlade Divac would sign off on the deal. Just last week, Divac said he was trying to get all parties on the same page but admitted that the Karl-Cousins pairing is " not pretty right now." "Cuz and I have to work together to get back together, and I think we will," Karl said Monday. "All of our guys are hungry for winning. And Cuz is our best player, our most talented kid. And we need him to feel like there's a commitment from both sides, from he to us and from us to he." The Kings have gone through an offseason makeover that brought Rajon Rondo, Caron Butler, Marco Belinelli and other newcomers into the mix. "Whatever this is called," Karl said, "it was necessary." The Kings last played in a postseason game in 2006.